You could be forgiven for thinking that Montauban is a rather boring place. 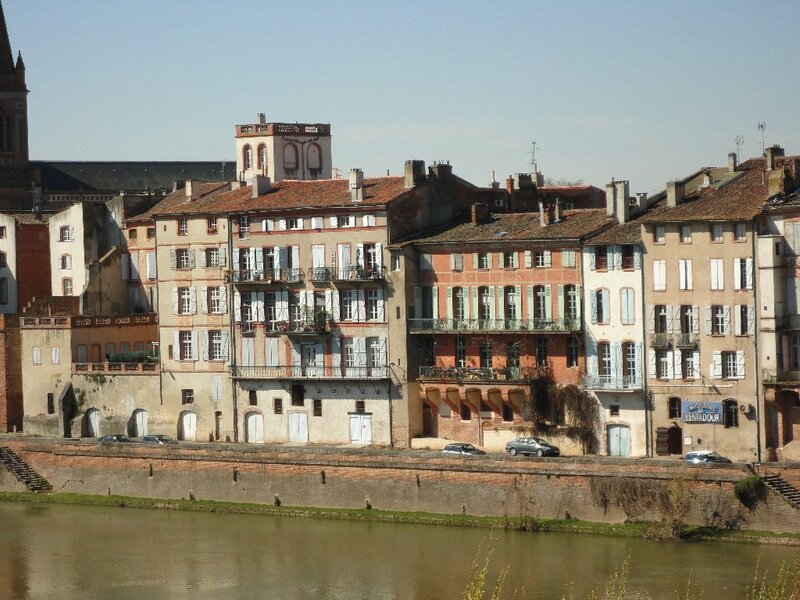 Unlovely suburbs surround the centre and the A20 motorway bypasses the town, so most people bash on to Toulouse, some 45 km further south. However, the town has its place in history and has some interesting monuments and anecdotes associated with it. Montauban is the préfecture, or administrative capital of the Tarn-et-Garonne département. Thus, we go there periodically to do battle with French bureaucracy. Having saved up as long as we could a range of boring but essential tasks, we set off in wall-to-wall sunshine yesterday for a visit. I left the Statistics Freak arguing with a Rosa Klebb-type jobsworth at URSSAF and went off to take some pictures. Apologies for the inevitable vehicles – you can’t get away from them, except in the partially pedestrianised Rue de la République. The Comte de Toulouse founded Montauban in 1144 as part of the Toulouse defences, but there was no doubt a settlement on the site long before that. Roman remains were unearthed during the construction of an underground car park. The town was initially called Monta Alba: the latter being the Occitan word for willow trees, which still grow abundantly on the banks of the River Tarn. The layout of the medieval town followed a grid pattern around a large central square, prefiguring the later bastide towns of the southwest. The current Place Nationale was rebuilt in the 18th century following two devastating fires in 1614 and 1649. All that now remains of the medieval town are the 13th-century steeple of l’église Saint-Jacques, the 14th-century Pont Vieux and the chamber known as the Black Prince’s hall in the Musée Ingres. 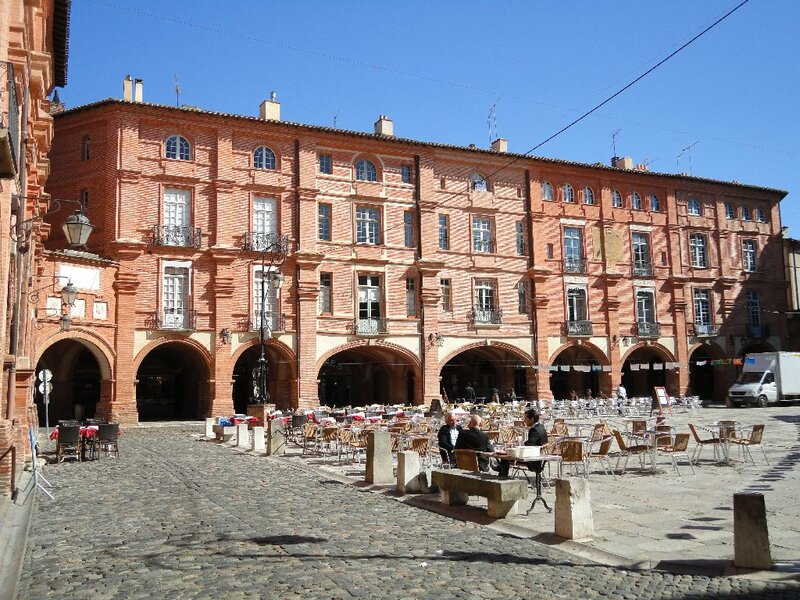 The town is noted for its pink brick buildings, like Toulouse. Set in the middle of a fertile plain, Montauban became a centre for flour milling, silk weaving and wool-spinning. This brief period of prosperity was brought to a brutal halt by a combination of the Hundred Years’ War and the plague. 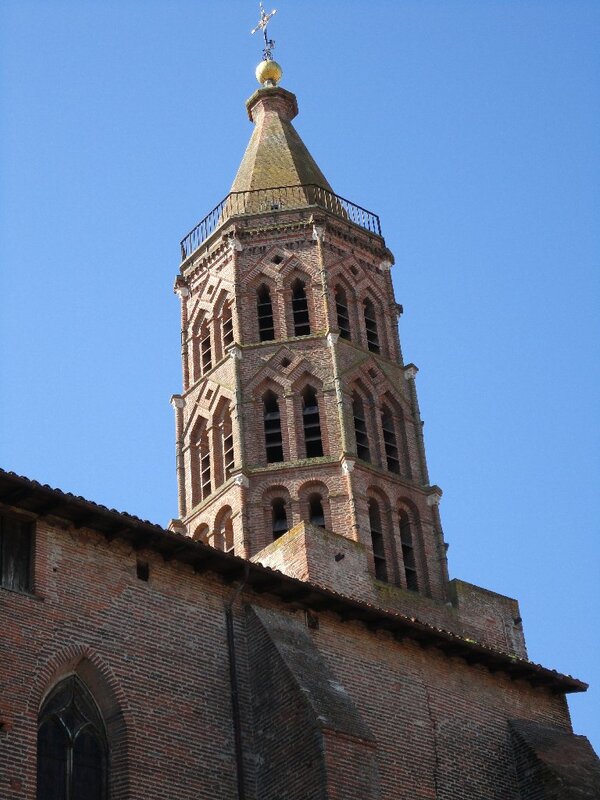 Along with La Rochelle, Montauban became a protestant stronghold during the Wars of Religion. The people of Montauban withstood a long siege by Louis XIII in 1621-22. An alchemist or soothsayer advised the King that the Montalbanais would be scared into giving up if he fired 400 cannons simultaneously. However, the townspeople, far from being scared, were having a party inside the fortifications. This gave rise to the phrase ‘faire les quatre cents coups’, which means to have a riotous time. Nonetheless, after the fall of La Rochelle in 1629, resistance crumbled and Cardinal Richelieu brought the town back to the Catholic faith. The imposing white stone Cathedral of Our Lady of the Assumption in the Place Franklin Roosevelt was consecrated in 1739. The four statues on the façade are the four evangelists. The story of Montauban’s elevation to préfecture is no doubt apocryphal, but it would be nice to think it were true. Legend has it that Napoleon, invited to visit by the burghers of Montauban, was so taken with the place that he declared it worthy of préfecture status. Placing one hand on a map of France, he drew an outline around his thumb to delineate the new département. This explains the tapering northeastern part of Tarn-et-Garonne (where we live). Bites were taken out of the neighbouring départements to create it in 1808. As for famous Montalbanais, Olympe de Gouges, an early feminist, was born there (see my post about her here). The painter Jean Dominique Ingres and the sculptor Louis Bourdelle were also sons of Montauban. There is now a Musée Ingres, housed in the palace that the English started to construct during the Hundred Years War. I have to admit, to my discredit, that in 14 years, I have not set foot in the place, but that’s mainly because Ingres is not one of my favourite painters. They do have temporary exhibitions of other artists’ work, though, so I don’t really have an excuse. As in all French towns, you can eat well or badly, cheaply or expensively in Montauban. There is now a Michelin-starred restaurant in a swanky hotel set in a former monastery down by the river. Les Saveurs d’Ingres, next to the museum, is also reputed to be very good, but at 25€ a throw for the lunch menu (even pricier in the evening) it ought to be. The cafés in the arcades around the Place Nationale spill out onto the square on fine days, but they are invariably disappointing. 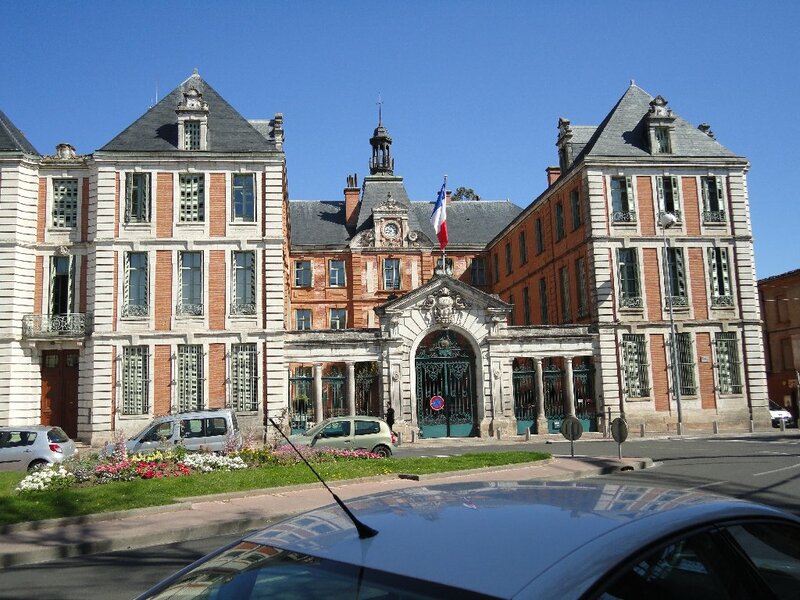 If we lunch in Montauban, we normally eat at La Bellevue, which has a first-floor terrace overlooking the Préfecture. For 12€, they do a buffet d’hors d’oevres (eat as much as you like), plat du jour and buffet de desserts. Not haute cuisine, but good food and reliable. 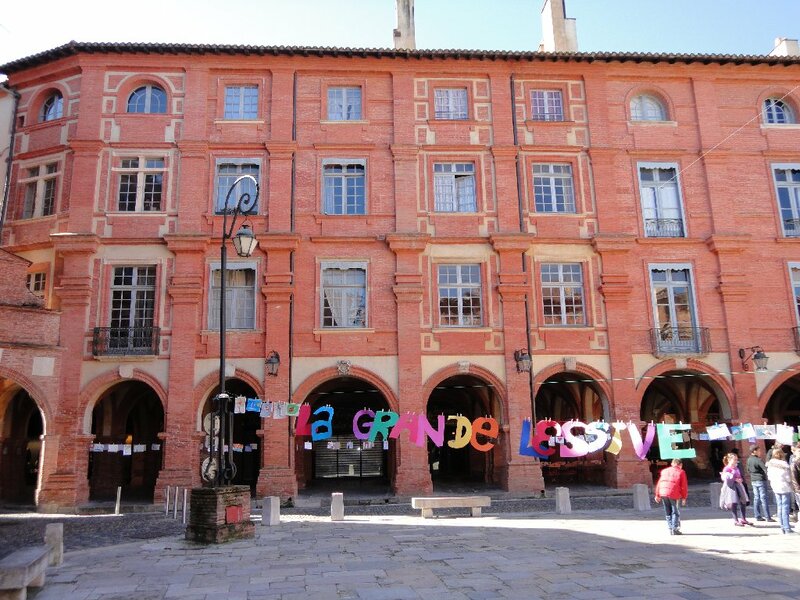 So, there’s more to Montauban than meets the eye. You would probably exhaust its possibilities in a day or so, but there are many other things to see in the area. It does suffer, though, from its proximity to Toulouse, which means that today it is a bit of a provincial backwater. Tourist Office website – navigable in rather eccentric English. Ville de Montauban website , is actually more informative, but is navigable only in French as far as I can tell. 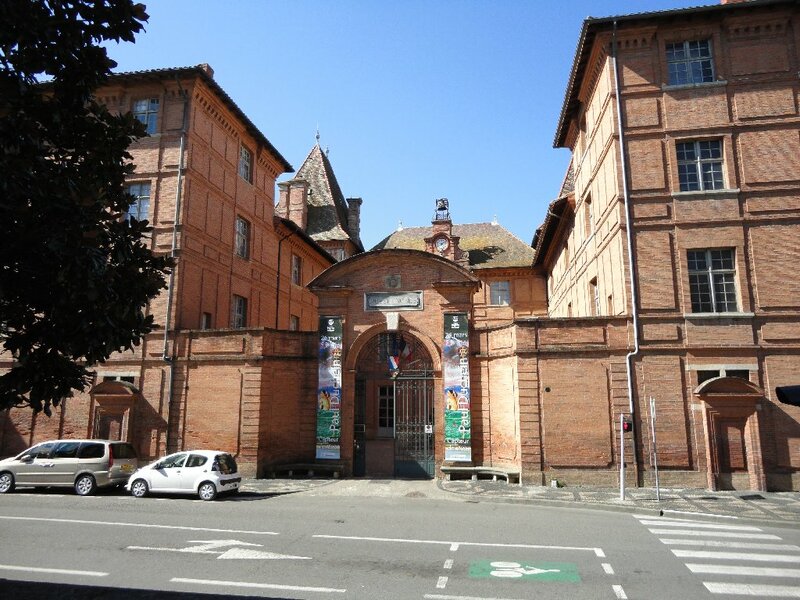 This entry was posted in French life, History, Personalities, Places and tagged France, Ingres, Montauban, Napoleon, River Tarn, SW France, Toulouse. Bookmark the permalink. I always thought Montauban’s name came from Montis Albus ( White Mount in Latin ) or its Occitan equivalent . Sure of your ethymology ? The French aube, as a prefix or a suffix always comes from alb- . I have actually seen either or both in different places. 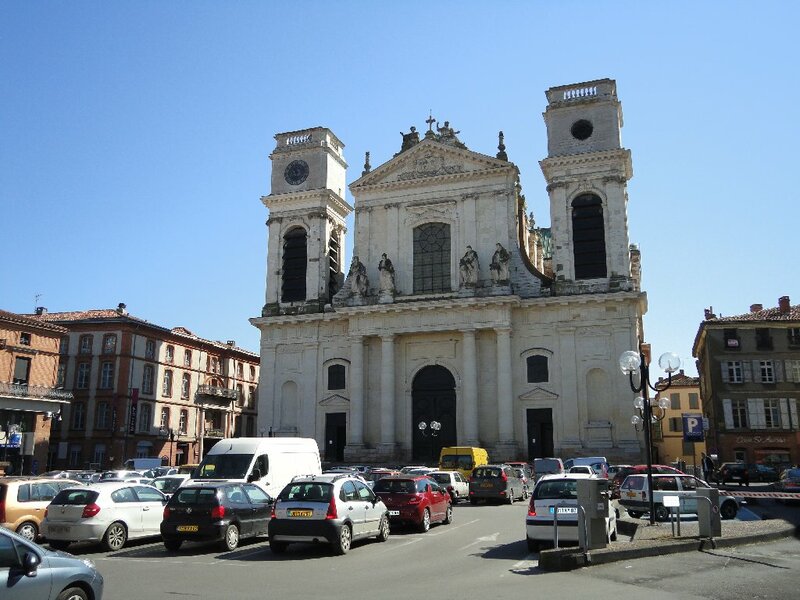 La Ville de Montauban’s own website says that when the Comte de Toulouse founded the town in 1144, ‘Il lui donna le nom de Montalba, le “Mont des Saules” ou “Mont Blanc”, par opposition au nom de l’abbaye voisine de Montauriol, le “Mont Doré”.’ So there seems to be some doubt. I’ll look into it some more and see if I can come up with a definitive answer. Interestingly, that website doesn’t mention Napoleon’s thumb or hand, so they clearly don’t believe in it. I have read it in many other places though, so have included it, but with reservations about its truth. That Napoleon, he got everywhere… A lovely, lovely photo trip once again, Vanessa. I particularly like the nearly empty cafes in the Place Nationale – I want to be there in the sunshine! – though no doubt the proprietors are looking forward to the summer rate of business. We had a holiday near Montauban a long time ago so it was lovely to see it again. And what a fascinating history it has. I’ve learnt lots of new things this morning – a good start to the day. Hope the argument with URSSAF went your way! Yes, Montauban is more interesting than first impressions might imply. Fortunately, the URSSAF woman realised eventually that ‘ils s’étaient trompés’ but it will probably take some time before we get a refund!